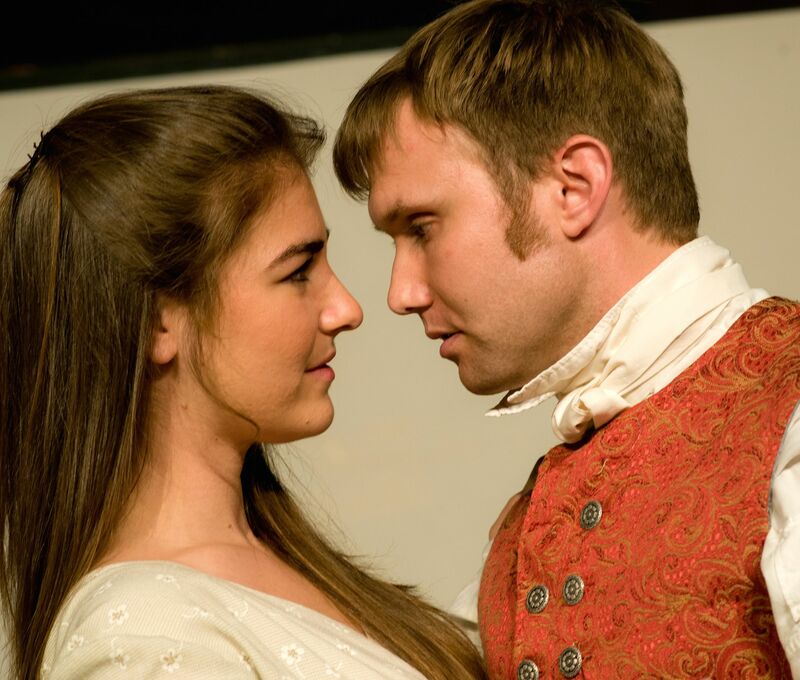 Arcadia, by Tom Stoppard, is Pear Avenue Theatre’s final production in its Pear Avenue performance space, and this is one not to be missed. The play is claimed by many in the critical community to be Stoppard’s finest, with timeless themes and witty dialog that will keep audiences enthralled from start to finish. The story takes place in an English country house in Derbyshire, England in both 1809-1812 and the present (originally 1993, but it can easily be 2015). The Coverly family has owned the Sidley Park estate in both time periods, the latter Coverlys being descendants of the former. We are introduced to a number of colorful characters from the 19th century in a classically farcical fashion, though some don’t arrive until later scenes. These characters include: the Coverly daughter, Thomasina (Monica Ammerman); her tutor Septimus Hodge (Robert Sean Campbell); the butler Jellaby (Nicolae Muntean, who also plays Richard Noakes, a landscape architect in the employ of Thomasina’s father); houseguest and poet Ezra Chater (Brian Flegel); Thomasina’s mother, Lady Croom (Diane Tasca/Monica Cappuccini 1-5 July); Lady Croom’s brother, Captain Edward Brice of the Royal Navy (Charles McKeithan); and finally Thomasina’s mischievous younger brother and Coverly heir, Augustus Coverly (Jason Pollak, who also plays his descendant Gus Coverly in the present). In the present, Hannah Jarvis (Elizabeth Kruse Craig) is a writer investigating the Sidley hermit who once lived on the grounds. Bernard Nightingale (Dan Kapler) is a Sussex literature professor in hot pursuit of data to solve some mysteries surrounding Lord Byron, who coincidentally also stayed at Sidley Park at one point. Valentine Coverly (Michael Rhone), a modern mathematical biology post-graduate student, brings forward some insights and materials that are of interest to both Jarvis and Nightingale. Finally, Valentine’s younger sister Chloe (Roneet Aliza Rahamim) acts as a bit of a conduit between Jarvis and Nightingale, if not personally, at least professionally, though Chloe muddles the personal connection by stepping into the middle of it. The play is fast-paced, and Stoppard weaves fascinating connections, some might say embodying a performance version of chaos theory. Stephen Hawking’s treatise, A Brief History of Time (published in 1988), directly influenced the play. In fact, Hawking is referenced in the play as “the one in the wheelchair” during a pointed diatribe as Nightingale rails against scientists, favoring instead the importance of literature and poetry. For much of the performance, the action alternates between past and present, with crucial connections being unveiled along the way. Action in the past is interpreted in the present as artifacts are uncovered by the academics, until the frenzied, and satisfying, ending changes the dynamics a bit. Janny Cote’s scenic design is simple, yet elegant. The set is a drawing room with a long table center stage where most of the action takes place. Three functional doors adorn the stage, one stage right, one stage left, and a set of French doors upstage leading to the garden, a small bit of which can be seen through French doors and upstage window frames. The Coverly estate is the same in either era, and one curiosity is the presence of a small tortoise (named Plautus in the 19th Century and Lightning in the present day). One might wonder if it’s the same tortoise as they are quite long lived. In either era, he seems to be a handy paperweight. Gordon Smith’s sound design is spot on, taking piano cues from the script and selecting timeless pieces to both accent scenes, and cover period changes as cast members switch out. His design also includes outside noises, such as an engine and distant gunshots, without overpowering the scenes. Director Jeanie Smith incorporates this design into the action beautifully and guides her cast in making both the farce and more serious action believable. Smith’s cast forms a tight ensemble, each member donning a British accent, and though some members waver just a bit, the pronunciation missteps do not detract from the mood or the story. Witty repartee abounds in dialect in both timelines. In the past, Campbell verbally jousts with Ammerman and with Flegel, each very lively, and very funny. Campbell looks comfortable in his role as Septimus. He mugs a bit, just adding to the farcical nature of the action. Ammerman is intense, as an adolescent on the cusp of “adult” understanding might be. She’s also playing a prodigy quite convincingly, clearly ahead of her time academically as her character pulls together a loose theory of Chaos, which wouldn’t be formally understood and claimed by others for over 150 years. Tasca’s Lady Croom is a stereotypical aristocrat. Her character is never wrong, even when she is. Croom takes her position and doggedly defends that place and stature that is owed her. Tasca is clearly enjoying her character’s position, and plays it convincingly. Muntean assumes a unique posture and attitude for each of his roles. His Jellaby is the somewhat stuffy butler; whereas, his Noakes is more academic, more worldly. The other double role actor is Pollack splitting his time as Gus and Augustus. While similar, even though the two characters are from different time periods, his depiction of Gus is a tad more furtive. Staying in the present, Craig and Kapler also have many witty battles, spitting clever dialog and never missing a beat or dropping character. Their scenes are intense, as foes and reluctant colleagues. Although researching different theses, their pursuits are intertwined more than their characters initially realize, though they eventually come to understand the degree to which their interests are shared. Rhone’s Valentine is somewhat tortured, the pain visible through his facial contortions. His character is also slightly ahead of his time, but Valentine’s insights provide just enough hints to allow others to make major breakthroughs in their studies. Rhone and Rahamim have a few passing sibling tussles as well, adding authenticity to their portrayals. As for this being the last of The Pear Avenue Theatre, it is, at least in this incarnation. When Arcadia closes, so does this intimate 40 seat house. But The Pear will endure, and will move to a new location at 1110 La Avenida, just a couple of blocks from their current site. The new Pear Theatre (so yes, it’s still to be The Pear), will more than double its seating capacity in a state of the art black box space that can be configured to seat 80 to 99 patrons. So come be a part of celebrating the first 14 years of bringing exciting theatre to intimate audiences, and don’t miss Arcadia. It’s a terrific production of a world renowned Stoppard play. Then get ready to enjoy a new season, in a new home for the next phase of the little theatre that is The Pear. When: Continues through 12 July 2015, Thursdays-Saturdays at 8PM, Sundays at 2PM. ← No lions, no tigers, but bears, oh my!